So far the year 2011 has been compiled of some pretty outstanding music. 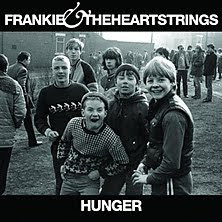 I have already put together a list of my favourite albums of 2011 (So Far...) well this album 'Hunger' by Frankie & The Heartstrings surely needs to be included on that list. I would even go as far as putting the album at #2 right behind my beloved Radiohead TKOL album. I had to buy this album as an import as it is not available in the USA just yet, which is too bad. A part of me loves finding stuff like this and buying imports though, not sure why just somewhat of a thrill to spend 3x the amount on an album I guess. Hunger is such a nice refreshing burst of music, leaving you very content after listening to the entire album. It is a nice little 10 song debut album that rarely is side tracked. Each track on this album has a purpose and belongs to be there just as much as the other 9 songs. Some of the highlights for me on Hunger would have to be the songs (well) 'Hunger' itself and 'Photograph' and some other more low key songs such as 'Fragile' and the strong closer 'Don't Look Surprised'. But to be honest I could pick anyone of the 10 songs and oh and ah about how they made my day just the same. 'Photograph' is a bursting intro that put me in awe even before I heard the first lyric on the song. 'Hunger' is a solid little track that gets the energy flowing and is somewhat the center piece of the album - which would make perfect sense for the title of the album as well. 'Fragile' is a really nice slower jam, offering sounds of bells chiming to start things off, and having some solid backing vocals to set the pace of the song. It is a well put together song and the lyrics are as 'fragile' as the title itself. 'Tender' is next and is another easy listener with some friendly piano sounds mixed with simple guitar sounds, bells, and vocals. 'Want You Back' offers a lot of pretty cool instrument sounds going off at the same time helping to create a great tune. My favourite song off the record would have to be the closer 'Don't Look Surprised'. I just love the intro, and find it catchy from the start. I also like the fact that the song is a little longer at 5:44. Overall Hunger is a great album and one that needs to be listened too be everyone. I would rank it right up at the top for albums of 2011 and I even only being March I can safely say this will be in my top 10 albums at the end of the year. It really has hints of The Clash or even The Cure at times (Check out 'Possibilities' for proof), kind of a mix of the two along with an 1980's Brit vibe to it. It was hard for me to really find any flaws in the 10 song album, it just left me content and wanting to re-listen to the whole thing once again. A couple of good songs, but this one didn't entirely win me over. I think they'll get better with time, but so far, my favourite thing about Frankie & The Heartstrings is the video for the title track, featuring Robert Popper. If you want to see what inspired the video, check out Robert's work on the UK comedy show 'Look Around You'.